Not Hifi says you & indeed they aren't. But some have the appeal of old hifi as well designed items that look cool and you don't need to use them to appreciate them. Much industrial equipment was so well made & with a great retro & timeless style, why not use them as Ornaments? It's our site, the Hifi pages get hits from being found by Search Engines & we like to share the info on more positive subjects. We first got an Underwood for a Fiver in the early 1990s & saw them at a time when they were unwanted as old & dirty but were starting to be used in Themed weddings of all things & so we started buying them. The better ones mentioned here made up to £250 if the rougher ones even tidied up only made £75. In the end to bother & blindly gamble on them lost the interest as Hifi took over as the odd page here hints. But it got to be too much work & many were rougher than expected if a few were fascinating gems that got written up here a few years ago. Forgot this wasn't online & as it seems so long ago if we just kept one, here it is again to help the eccentric world folks who care about kooky things... Extra Obsessive Points to you for knowing why the years look like that. We still accidentally type an 'O' instead of a '0' from typing random stuff on one of these years ago. Because they are well made with old world looks when even humble daily items had more than a little style, these look good today as an ornament. A big heavy but intriguing one that gathers dust but easy to brush it out & they don't smell once they've been in the air a few months. Wedding Theme Planners used to buy our high grade ones & with them getting a cleaned & serviced working one, they probably have been used many times since. The first one we got for a fiver sat on a table with a bit of paper in & in the days pre computers when we used to have an imagination & wrote bizarre comedy things here & there & naturally a silly thought goes easy on a typewriter so it stays. Not having read those for many years as we threw them out it appears on checking, they probably are as amusing as confusing as were our old printed lists from the pre internet days, a lot of the stuff we used to put on the page top came from those sheets so it survives as we kept our copies. The days of Uncle Stanley, eh? Photos at the base of the page. Our favourite Typewriters are the Underwood No.3, No.4 & No.5 that were produced from 1900 to 1933 though newer designs started from 1931 so ones after 1930 don't rise too high in the serial numbers. 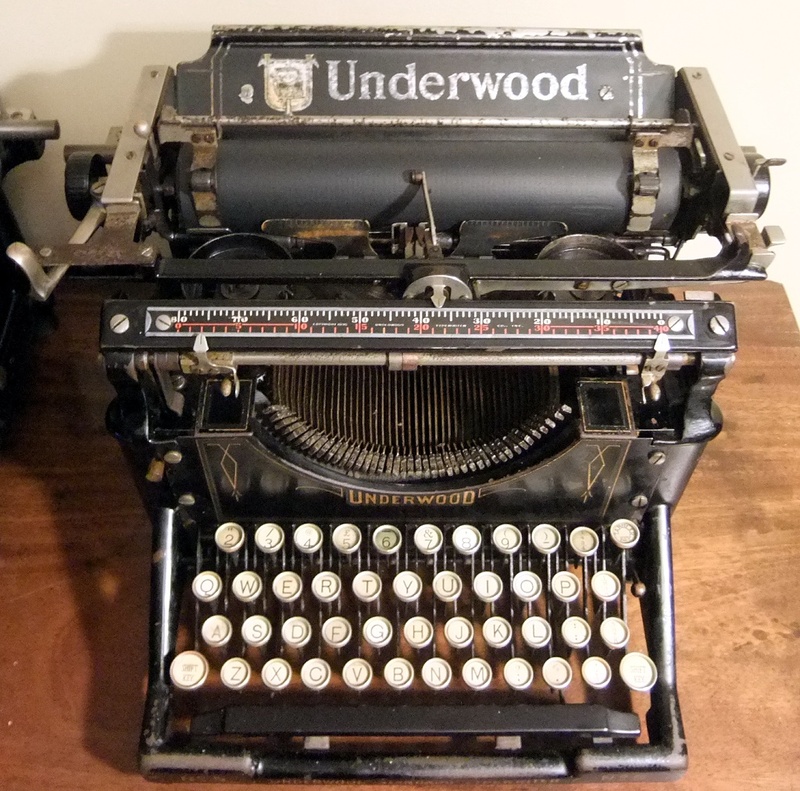 These Underwoods sum up the style of typewriters 1900-1930, not many after have any sort of appeal, only the prewar Grey Underwood like Churchill used look nice. These came with varying types of carriage, the Standard 10" one to a massive 26" one for professional Draughtsmen & the like. If you type on one today, it will look & feel very different to a plastic keyboard. It is hard on the fingers pounding those hard glass keys & is slower than how fast you can type even on an electric typewriter. Think of the poor women in typing pools banging their fingers away on these things for many hours a day, must have caused a lot of problems in later life. The No.5 is the most often found as it has more keys than the No.4 which lacks the fractions keys. No.3 has the wider carriages & the larger top bar with the wording on it. We have a No.3 that was sold in France so has French key variations & the shop sticker, though the shop was opened 2 years after the serial number suggests. Our French one is so crisp & barely used with all the decals that it stays! The Underwood typewriters that were sold in the UK from the mid 1920s as a good estimate, were reconditioned ones always repainted and with new decals added. The paint will be crackly looking in the way paint over old paint goes. These ones are often 15-20 years old when sold as reconditioned as they are such solid machines. They sold in their millions worldwide as the serial numbers suggest. With War needs for scrap metal, there must have been plenty scrapped as they were obsolete with the noiseless ones. The ones that survive were stored away forgotten & only surfacing when houses are cleared out. The earlier ones usually found in the UK from the Early Teens had Art deco type patterns, the complete decal set should be eg "No.4 Underwood Standard Typewriter No.4" on the lower front part by the space key in a lined box in Gold, most often found worn off or overpainted. The back will have a large amount of serial numbers & years, the latest being within a year of the typewriter's serial number. There are gold stripes on the front keys side panel & 4 chevron style patterns on the 4 side pillars as well as box lining on the panel in between. See our photos. These typewriters were used for a long time until the Second World War when the quieter "Noiseless" ones came into fashion making these obsolete. All Noiseless seems to mean is they are cased in more, the mechanics look the same. They often will have been overpainted again after factory refurbishing on the back patent numbers but this can be removed to reveal them, if you're lucky. You even find the black No 3, 4 & 5 repainted Grey to match the later 1930s ones. They don't collect too much dust standing as an ornament though a blow through once a year will keep it smart. After cleaning & oiling they do smell a bit, the waxy key rest & old ribbon ink you won't fully get rid of unless you use harsh chemicals & risk spoiling it, so a week by the window or outside somewhere dry getting the air will sort that, or your room will smell of old typewriter! One fault we've found is with the Back Space Key. It is a part that needs accurate adjusting to get it working exactly if it's not worn from use. So far on the No.3 & No.5s we've had, the Back space rarely works despite the parts all being there. But from the 1927 French No.4 & a new arrival 1917 No.4, the backspace works fine. But these two look much less used, no doubt the part wears & goes off the fairly tight tolerance spec. It's nice to know it fully works, but people are buying these as ornaments & even one we sold was used at a Wedding for some use. For those used to old typewriters with what you typed there forever unless you used Tippex bottle or paper, or just retyped it on a new piece of paper. How spoilt we are now with Word Processors! These were clearly a popular brand, but after WW2 there will have been few left around with the heavy scrap weight people will have scrapped them as the War effort needed metal. Spotting them on TV is interesting, Sykes Series 3 Ep 1 has an early likely No 5 but a mid 1930s-1940s repaint in light grey & found similar on ebay. 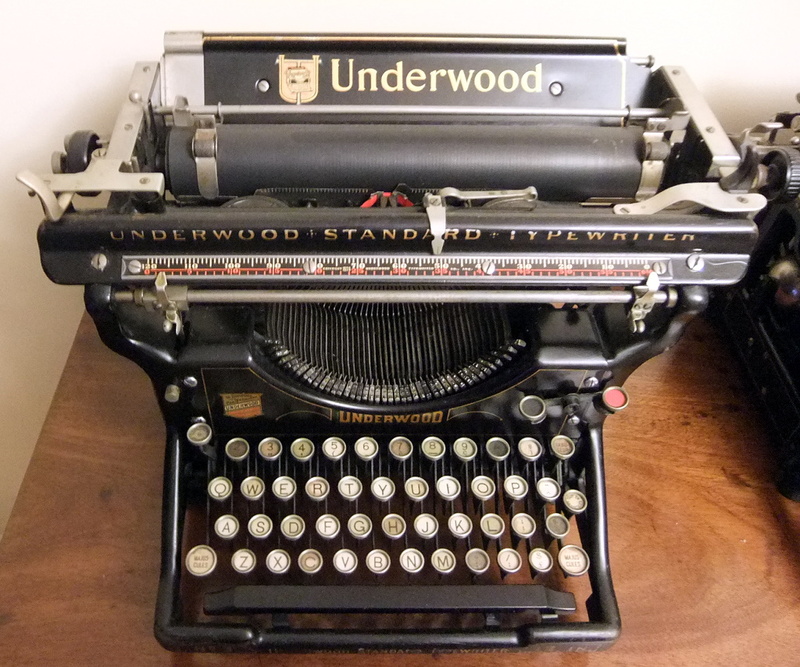 This one is a 5 as the serial number states, all medium-light grey with only the Underwood logo on the front, the back has no dates, but they'll be under the paint. The back paper slide is grey too with a later small logo, so definately an official revival. The 2247xxx number dates the machine originally to 1927. Maybe these were still being recycled in the War years as people still needed to type & if on a budget people bought a reconditioned one. It's just a sign of how slow life was in the non City areas of the UK for items this big to be stored away in attics for decades as people didn't move house & stayed in the one house all their life as did their parents. Probably now, as with a lot of collectables, this is the time many are surfacing as time beats the owners. The highest price paid was $500 on a supposed rare early No.1 model with original tin lid & wood base from 1896-1900. The number of 12997 suggests it's actually a 1906 No.4 or No.5 really & looks a bit like our 1907 one, though the sides & back are a bit different. There does appear to be a good market for clean, higher grade & working ones as the frequent healthy prices of $200+ show. Ones with odd extras seem to be priced high, too high & not selling. Buyers don't seem to mind which year if the pre 1930 ones, but the wide carriage ones aren't so popular. It's because they look timeless & are well made, the top range brand of the era. This one has no Back Space key or Red-Black Ribbon front lever! The earliest we've had before was a 1912 one, a 1907 in the UK or anywhere is very early, though the 155xxx serial number means many thousands were made. How many survive for the metal scrap value & these were obsolete by the end of WWII as quieter ones arrived. This one has black keys with no Glass but a sort of celluoid type which give the idea they are 1930s replacements though no sign of scratches from removing the old ones is present as these must have been done by a machine. Where are all the sets of replacement keys now we need them? Oddly we got another 1907 one just 342 numbers higher than the other No 5 but with nice white glass keys, all the gold lettering inc the No 5 on the front bar if a bit on the rusty-dusty side. The tab bar scale has 1923 on as replaced though the back dates go Sept 22 1890 to Jan 20 1903. Nos 4&5 are numbered together & the 5 has the fractions keys the 4 lacks. Very rare these ones with no red-black front lever & no paper guide. Clearly a longtime loft or garage-shed sitter though it has had tidy use in it's day as the right roller knob is worn smooth, still has the rubber feet intact if gone solid. The lines on the side are original, not a refurb-repaint job as the screws aren't overpainted. This is a rare one indeed. But crusty from prolonged damp if not wet. 4 tab pieces on the back bar, later ones had 5. Has potential. Afterr not touching one of these Typewriters in over 6 months as the last batch was hard work, this 1907 one needs sorting out. Ignoring the rust & dust it's one of not much use as still crisp in ways, the bootlace spring cord is intact though the ribbon is probably past it. The back 1890-1903 gold text is bright too as are the keys. But anything chromed is crusty from 80 years stored in a damp loft. It's a rare item & careful if heavy work is needed to make it even useable again. We'd keep one of the 1907s & the French bigger No3 but the rest need to go as until cleaned up they are smelly! They smell after cleaning & WD40 soaking too for a while so need good airing or your place will smell of them too, old man's musty house sort of niff. CLEANING IT. Taken it apart & all screws came loose with a little help, none sheared so it's probably salvageable to quite a good level. The main part gets a wash with Cillit Bang Limescale which takes the rust off to a degree too. Soak it, brush it around for only a few minutes once covered then rinse. Look at the muck that comes off! A puddle of dark brown dirt is the usual result, it's messy to do. Rinse & then dry with a hairdryer for at least 10 minutes to lose all the water possible. It should only be fully wet with cleaner & water for 5-10 minutes or the key labels etc start soaking too long. Once dry it looks awful, all whitey bits & out of a bonfire look. Fear not, literally soak it with WD40 from the trigger bottle not the aerosol as that makes too much spray mist. Drench it in WD40 to the point it runs off the draining board into the sink. Then let it sit. Use the keys, move all movable parts, this old damp not wet rusty one all parts move if the keys aren't perfect at first try. Once it's sat long enough 10 mins to an hour is unimportant, hair dryer it dry to blow away & dry the excess. Paper towel it off too then let it sit to air & soak longer in moving parts. How good it is then will generally be the best it'll be, sticky keys are rusty or damaged keys & to take it fully apart isn't worth it. Go wash your face & arms after the WD40 as any spray may disagree with your skin. After left in the WD40 for an hour, all keys now work, a few needed a little help but sorted now. 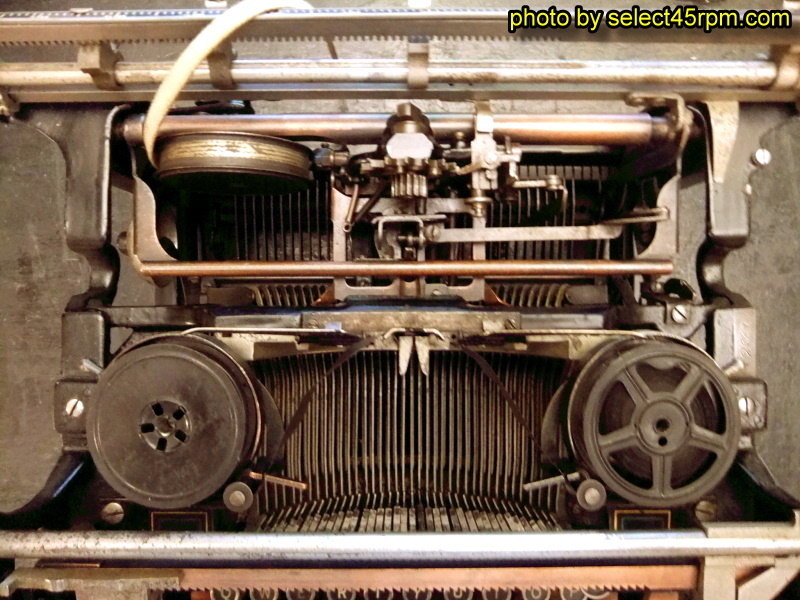 Shows how well made these old typewriters were made to survive. LOTS OF DIFFERENCES. Comparing it to the photo of the No 4 below the lack of Back Space means the "2" is further to the left & also we just noticed no Red-Black ribbon selector! On looking further, the Back Space appears by 1909 on a 251xxx serial number one, this 1909 one has the single winder, no back paper chrome guide. We'll see what it sells for as it's a very high grade bright one. Another 1908 242xxx has extra tab keys, the later dual ribbon winder, no chrome paper guide but has red-black ribbon lever, they want over £600 for it! Only found one with no red-black ribbon lever, but it looks odd with wrong parts & a 1913 latest date so ??? there. 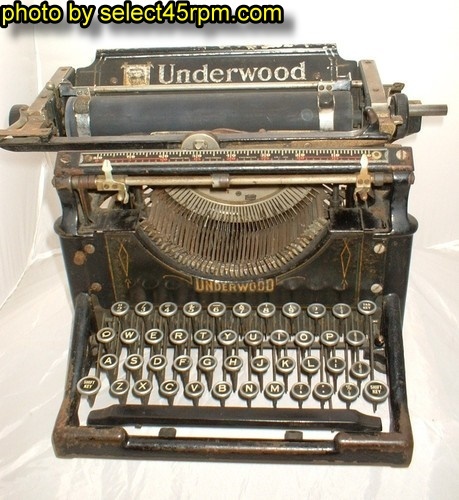 USA ebay has a lot of Underwood, not too many early ones, a lot of the No 6-11 model. We like these typewriters you can see. Looking at it now, the Colour Ribbon selector always looked odd & the Backspace looks added in too! Still have 'No Idea' what the spring loaded push button on the left does, it's unused on all 1907-1928 ones we've had. 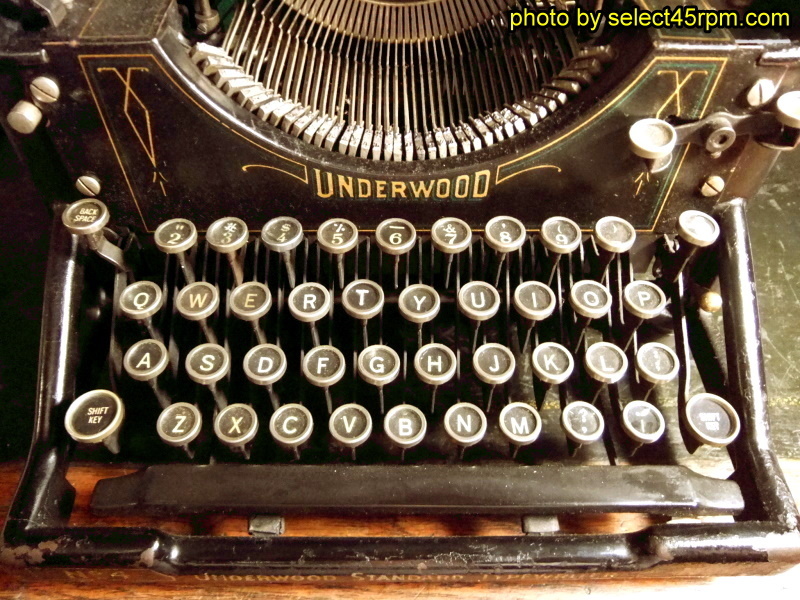 The 1907 Underwood logo on the back plate is a wider font & has a double gold border on it. Also has no paper edge guide chromed plate on the back plate explaining the wider font, which also now looks an add-on & looks neater without these extras really. This one has 4 tab parts on the rear bar. The Bell side view lacks the obvious curved extra carriage release button. All these add-ons made as other maker's added features & people expected them too. The Handle wind side differs too on this 1907 one, bigger wheel & different fittings & we even missed the Bell side has a wheel handle too, rather than the dual purpose later one! Another part missing this early is the movable ribbon threading slot pieces, the 1907 just has the fixed ribbon trays & a fixed slot. All these changes explain the multitude of Patent numbers. To get a 1900-02 model would show what else changed, probably the paper hold bar with the rubber wheels to hold the paper flat & whatever the left sprung button was for would be revealed. We only bought it as it looked clean & was good for the price, nice to get a bit of fascination too though we might not want to sell it now! On taking it apart, it's lacking parts that were used by 1912. The right roller handle is a 1930s replacement as are the keys. This one was certainly used for longer than most but in in less rusty condition. If it was a keeper you can swap parts around to make a best one, within the limits of the differences. Other ones we have to clean & sell have the right roller grip serrations worn smooth from the amount of use, the probably vulcanised rubber reacts with skin oils & wears away. The back paper guide on earlier ones is a bigger item with 4 curved "finger" parts to the item, later ones have a different way to guide the paper. To try to find one even earlier than this would be interesting. One wreck claiming to be earlier has the red-black ribbon lever & the chrome back paper guide, so clearly later. This is a rarity indeed. These sell well once clean & working, so worth buying as many worthwhile ones as we can. As of typing, there are 8 typewriters here, one French keeper one, 1 Remington & the rest Nos 3 to 5 including a wider one. Too wide they lose the charm, the best sizes are original & the 12". Over that size they are too top heavy, but rare as few 16"+ must have been made. Taking apart the Typewriter is fairly logical, though the carriage is under spring tension via the flat cord attached to the spring drum. Early ones you undid the locking screw & wiggled the catch to lose the spring tension & wound it up again to reset it. Later "improved" ones had a screw type system that is more fiddly as in turn screw to tighten, but ooh & aah it to loosen it. Hard to explain how so just try it & hold the screwdriver to loosen. If the tension cord is snapped or missing or missing an end part, you can make one out of a bootlace & make a metal bit, there must be a particular name for the part & a stockist somewhere? You can solder the ends of electrical hook-up wire & it works well. The typewriter cleaned up well, smelly after doing so a week away to air. Certain parts like the back Tab bar looked far gone, but actually cleaned up well. Beyond the rust it is a high grade little-used one with all original bits. The key covers are in good grade with the glass & white cards, as good as you can expect from one 106 years old. The keys themselves all type well so a testament to how well made these typewriters are, all screws we could undo easily except the carriage arm. A few minor bits to swap with the other then as it looks nice worth keeping a rare one with the French one too. Rare & original is important in collecting, or just to have one to keep as an ornament. The better grade one sold for £195. We keep buying these, if the price is right & condition looks worthwhile. But again like the 1907 one above, we have another odd one, without really looking much as it was cheap & just one front-on photo. This is a modified from new "silent" model. It's a 1923 No 5 serial 1687xxx, but this isn't like the usual repainted reconditioned one. It has an added outer wraparound sides, under & back with felt lining. In black with a matching Gold line. The 4 usual rubber feet are there & as untouched are intact, standing about 1" high, 4 flattened rubber feet are on the base of the outer box, put some felt feet on to keep it as-is. The handle to wind the ribbon is a knurled knob & is a factory fit to go with the outer box. It came in a very smelly from age rexine dust cover which has kept in as mint as you could expect, mummified to the front tab arrows, with the chrome typically a bit rusty as old damp housing dictates. Where has it been covered up & lost for so long? Paint drips on the cover but too tatty & smelly to keep. Assume a big loft & only time gets houses cleared out, but it's 89 years old and likely not used for 85 of those years. Spooky. Asked the mummified spider, but no reply as he went up the Dyson. The keys are all bright white with Back Spacer, Tab Key & Shift Lock in black. Can only assume it's all factory original as the Back Space works as these are often too worn & the NO 5 decal on the front is unusually high grade. It has an odd spring loaded part on the keystrike area that's a new find too. Funny what turns up when you just want these to make nice to sell. The screw heads are untouched even, sharp squared edges. Underneath on putting the felt feet on, the stop for the space bar has felt pads to cut down the noise. Even the leather stop visible on the back of the carriage is still pretty unused. The box part isn't screwed to the rest of the typewriter, though the ribbon knob is too big for the hole, push it inwards & it unscrews. Now to see what a fresh one looks like! Mint but aged is the answer. The bright gold lettered Patented dates go to May 8, 1917., never seen the left & right border line so clean. The chrome on the screws that were against the felt insides are as bright as new, the whole typewriter chromed bright must look great. The back Tab has 5 pieces on, some with 4 therefore are missing one. Now looking at the box, you see what the 2 unused screw holes underneath are for: this. The felt has holes to line up, but the felt put on the wrong way. Clearly this is a factory part extra & not many sold it's clear. Rare!! The typewriter has always been in the box by the high grade of the original feet. The ribbon winding mechanism has a different outer cog, no handle, but a threaded pillar that would not have been part of a kit, it's a factory made extra. The glossy black with bright gold lines, no side pillar chevrons by 1923, is remarkable. It seems the parts that saw air with thicker paint aged in that crinkly way, the protected parts are glossy like new. It'll need cleaning to conserve it, but this high grade will need more care to keep parts like screw heads crisp. It had been unused so long, the roller was "stuck" to the under rollers, a bit more force to turn it freed it & it does work, if a bit dry after so long unused. This is MUSEUM QUALITY, why isn't there more interest? We'll take some photos before deciding what to do with it. The fixing brackets underneath are on the 1907 one, unlikely people worried about the noise then, so maybe it was to simply bolt them to a desktop to stop movement when typing pools needed desks moving to clean under. Getting ultra high grade rare items is difficult sometimes, the originality of it all should have an appeal, but people like clean & working rather than historic, only on the "Chasing Classic Cars" show did a barn find in raw grade meet with those who appreciated it. Perhaps we'll let it sit for a while, maybe YOU reading this want an untouched rare variant. It has some differences as clearly a Premium Extras one, the middle paper stay that folds onto the paper is a thin bar not the curved one as there is an unusual flap-down guide with two 'V's to aid precision in typing somehow. The back paper guide with 'Underwood' on is backed with felt & using it with the early noiseless case fitted it deadens the sound as it doesn't resonate so much. Still quite noisy though & for the small difference you can see why few bothered with it. Sold for £295 to one who'll likely use it as a pretty ornament. We keep seeing these & buying from a photo that's not well taken is hard, you get rough ones or OK ones but rarely the better ones. Another No 5 we saw & it had such bright chrome can't refuse it. Never seen the front tab bar chromed, usually long worn off through use. The roller is usually well marked similarly. Not this one. Again the carriage paper guide & small roller assemblies all chromed nice. Serial number is 1581xxx 5 dates to 1922 & the back which looks more aged last date is May 1917. This one is clearly all original & you can see these were refurbished a lot. The glass keys have white cards & the Shift Key etc have a very old looking font. Sadly the left Shift Key cover missing, but we have one here that's too rusty that's getting used for bits so it'll be sorted. The keys crescent guide part is more aged looking even on one this bright. Oddly the Back Space isn't working, though it will get it's service & it did easily work. Ones this bright sell top $$$ on US ebay for how rare they are. We got a healthy price for ours fairly quick, all new ribbon, pretty looking & ready to use it'll be for a Wedding no doubt. Despite the overdose of Typewriters, still look for the Underwoods but really not finding ones rare or in decent grade. One in nicer grade if a later one of the 3/4/5 type made nearly £100 so nice ones certainly are wanted. Only the cleaned, serviced & fully working ones make the premium & are a lot of work sometimes. We like them. This one cleaned up to be the high bright Nickel plated one selling for £250 to a business woman who uses them for Wedding Hire, might as well buy a top grade one for that. Nice to think it'll see some hopefully Happy Times after our Restoring it back to life. Rare in these is high grade chrome, with the sound reducing outer case & without the front ribbon lever, about 1% of ones we've seen cover either of these 3 terms. 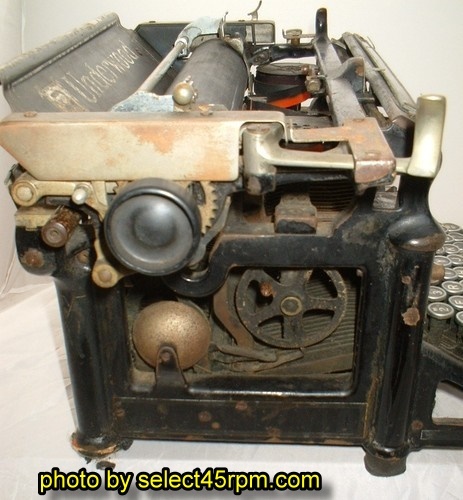 This one brings it to 8 typewriters here at one time, 7 Underwoods & the Remington. The French one we're keeping though this latest one could improve it, though it's a bit cruel if the whole item is nice & all were left as-was. The high grade one does have average chrome & then the 1907 one is fascinating. We like rare. But too many is too many. We've bought a few of these now, but it is very hard to get the Real Nice ones though buying is just about as Random as you can get, sellers photos hide rusty wrecks as well as hide gleaming beauties. The problem of getting the sellers who usually find these in deceased estates is they are not aware of couriers & packing. Down to our last three now after outing the rest including one parts one that still looked acceptable for decorative use. Now left with the big French one which looks very stylish if the white keys are dirty, but zat waz ze French & ze Smoking of those times, Monsieur. The odd sound cased felt padded one we've just finished after starting it months ago & the better of the 1907 ones is the third one. Those last two are exceptionally rare with the sound cased one being unique & it has other extras as well as being original paint, not a 1930s refurb when they were replaced by noiseless ones making them for a different buyer. We've put prices we've got for the Best Ones to help encourage the market, but beware a rusty sticky keys one is probably worth £20-30 tops to one who may take the chance to restore it to working grade & buyers expect you to courier them not travel miles to collect. Smart looks, tidy paint & the Gold lettering & lines is what makes the money, ie ones stored in dry conditions with the rexine covers over them. We throw the rexine away as too far gone on all, but it's done it's job & the new owner won't have to do much as WD40'd & just dust it. A bit of Shabby Chic can be acceptable but not aged rust & missing bits. For the time though, we'll leave the Typewriters be as all are a total Gamble to buy, we've had some nice ones but also a lot of work trying to make something worthwhile from others & the selling prices of ours have gone as low as £40 to offload one that was a bit sticky & a few bits cobbled from it to better others. Ones in lower grade even if working only made £75. The mess & lingering smell they make in cleaning & servicing them is like servicing a Car & not really for doing at home too often. And you need that parts one sometimes too. We've still got our French one & it looks nice as an ornament as many are finding with these old relics of some poor Office Woman's hard toil 80-100 years ago. 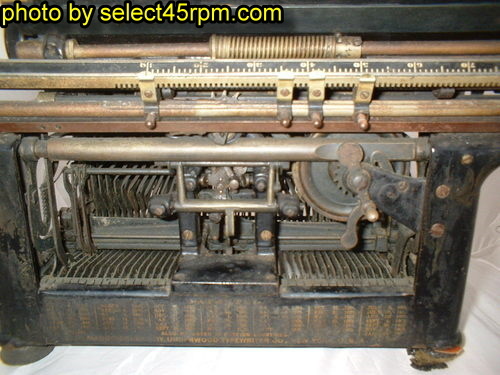 All those changed Patent Dates, but what changed in the early to mid-late years of this typewriter? The two remaining are on the Desk in front of us & they do smell lightly as we've said before though it does fade. Ignoring the Extras on the 1923, you want to know how they differ in the way Collectors like to ooh & aah at Rare Bits. So interesting to find out, get drooling. Quite a lot is exactly the same on both, but there are a multitude of differences that will stop you cobbling one great one out of several unless dates are close. Keys are both the original white cards, glass & Nickel plated round fittings. 1907 top numbers row is exactly the same as 1923 if 1907 has a white 'Tabular Key' and 1923 has a black 'Tab Key' as well as the black 'Back Spacer' introduced in about 1908. The QWERTY row is identical, the ASDFG row similarly, ZXCVB row has "?" and "," on both, 1907 next has "%" and "." then "!" and "½" but the 1923 differs with "." and "." (twice upper & ;lower) and then "%" and "½" omitting "!" but you can make it with a ' then backspace and add a . so it'll be out of line probably. Both have "Shift Key." & 1923 adds "Shift Lock" in white on black like the others. 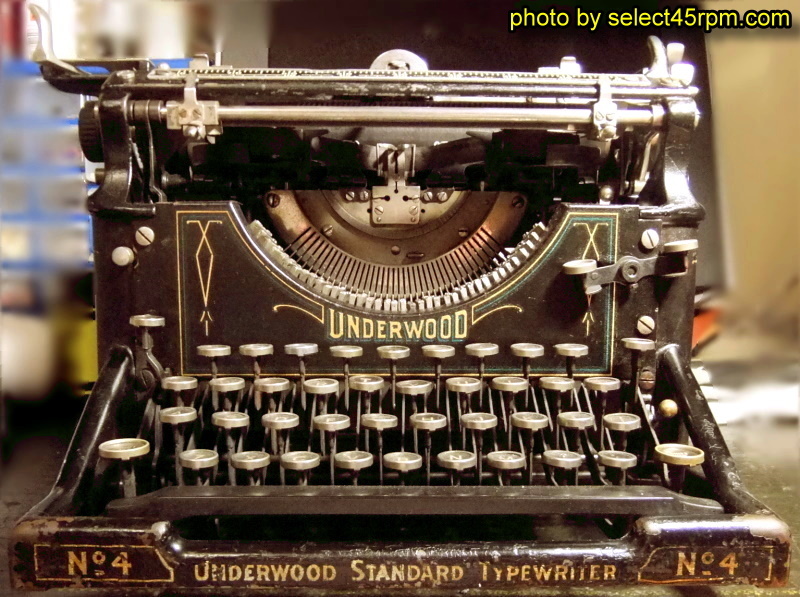 Both have the same "No 5 Underwood Standard Typewriter No 5" logo on the front bar. Going to the area on the left above the Keys, both 1907 & 1923 have thee round Push Button that does nothing at all except if you hold the left front tab slider in the 'Bell Ring' position this button holds it in place for an unknown reason, maybe to stop the bell: the 1923 of little use actually Holds the Tab in Silent Position, so when new or top grade it does Silence The Bell, at last: mystery solved! The 'Underwood' plate next to the Numbers line changes with the obvious 1907 lack of the Red-Black ribbon lever. This was introduced in 1908 it appears & the Art Nouveau chevron that is openly shown on the 1907 gets onscured & a part cut out. There are differences in the metal plate, the 1923 is more curved as it angles in making a tidier item, the 1907 is squared with an extra decal and a sharp squared corner to risk hurt. 1923 one without the Nouveay decal has a bigger curl to the one by the name. In line with the top of the 'Underwood' plate, the shoulders of the main body stick out further on the 1907, flush on the 1923. Going up, the Front Tab Bar two minor differences with the bar on the 1907 that holds onto the Keys rest pad gone by 1923 as is 2 fittings in the middle that are stops. One obscure change is the Left Tab adjust lever on the 1907 is at the right & in the middle on the 1923 & the arrow pointer metal is a different size. To the Carriage now & the 1923 rides about 4mm higher. Both have the same 1895 copyright on the bar which changes to '1895 1923' as two lines on the later ones. On the Carriage top the plates that attach with screws change over the years as do a pull out metal knob part to free the carriage totally so it doesn't click notches. The paper 'tray' part on the 1907 is the same size as the 1923 if the logo is slightly different & the 1907 has the Nouveau styled double border line to the later one border line. The 1907 doesn't have the Plated paper guide either & it's supporting slide bar. The two roller guides that sit on top of the paper are just slightly different. The side wheel winder is a dual-purpose one wheel on all we've seen including a 1912, but 1907 has the earlier two wheel version, one for each spool. The 1907 has a different friction mechanism for the winding wheel on the right side. 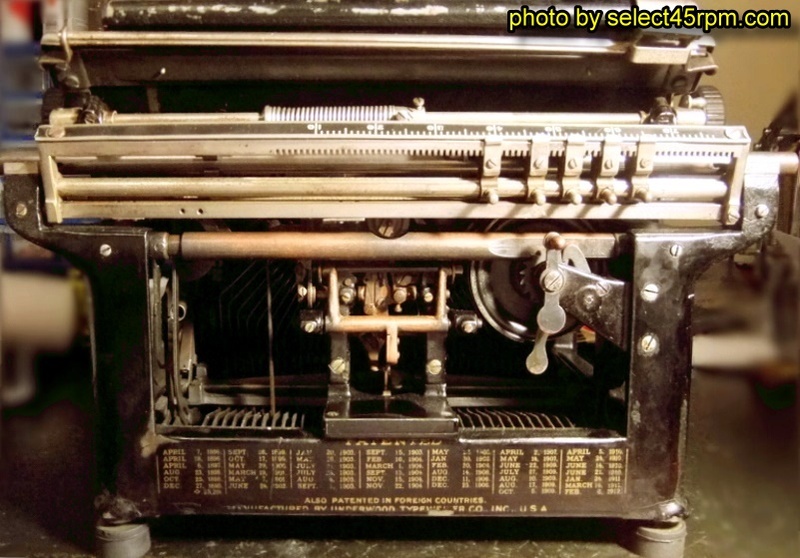 The 1907 has the spool mechanism with the fitting bar to the serial number space, 1923 is more tidy looking. 1907 until at least 1916 has the Noveau chevrons design on the four pillars of the typewriter sides, the rectangle hole by the front tabs bar is enlarged on the 1923, the 1907 is small enough to trap a finger! The left side with the bell is more flush than on the 1907 & the actual shaped long lever rods the keys are on are with a rib to aid strength, the 1907 have flat lever. The back lower 'Patented' panel on the 1907 starts with Sept 28, 1890 and ends with Jan 20, 1903. For the deate to read 1907 the Patent dates panel was not updated as often on any of these we've had, the Serial Number is always a few years later, maybe there were big delays in getting a Patent accepted. 1907 says 'Manufactured by Underwood Typewriiter Co., New York, U. S. A.". 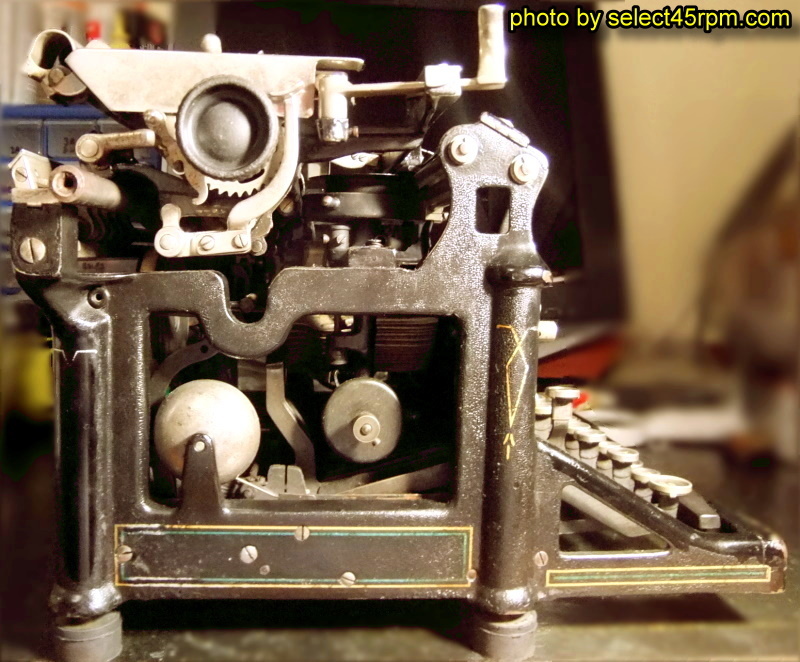 The 1923 starts with May 23, 1905 & ends with May 8, 1917 with 'Manufactured by Underwood Typewriiter Co., Inc., U.S. A." with the same +23,201 number & 'Also Patented in Foreign Countries'. The back tab bar has 4 tab pieces on the 1907 & 5 on the 1923. The Spring Tension winder differs & changes in the early 1920s from the Wind Handle & scrary escape lever with a holding screw to a safer Plated screw & knurled knob with grub screw to lock. Undoing the tension on the earlier ones is quite voilent & will have resulted in finger agony of varying sorts & broken springs. These are heavy beasts & picking them up carelessly will guaranteed to free the carriage & grip a foolish finger hard & leave blackened fingernails & deep welts in flesh. We know. And onto the Undercarriage which also varied quite a lot. The Space bar arms were fitted wider apart on the 1907 one. The Backspace lever adds several bars & a metal loop to protect it a bit. The two screw holes underneath actually match the noiseless box on the 1923 one but the padding inside was put the wrong way around probably as bolting it on resulted in less noise reduction as not isolated, rather than an error. Tiny differences in shaping & how a bar is sprung is about the lot. Those old rubber feet are still soft after 90-106 years though the high grade 1923 ones we can't undo easily, they'll be the usual square bolt set into rubber sort. Both are interesting, but in the Domestic setting as visual decoratives the dilemma is which to keep. The 1907 is in good condition, not the tatty as-found one pictured below though we swapped the back paper tray with ours. With aging to put it into the 'Shabby Chic' category as it'll look a bit too used for one's Drawing Room, but it has a soulfulness. Photoing all 3 in a line from far away looks like a Typewriter shop though up close the differences reveal. But the 1923 is a remarkably clean one, perhaps to better the Plated parts on the top side with swapping, but the rare noise case makes it a collector's piece. Be sure a collector in USA would pay well for it as there are none around to see & no sites even mention the noiseless case which is 100% original as the spool reel part differs & it has the same Gold lining to make it a Museum piece with a little top plating swaps. Rusty ugly ones are £20-30 gambles though & the majority of what there is after 80-100 years, though the styling of these pre 1930 typewriters means even the rustiest one will find a home. Is what will need doing to any of these you find. After having at least a dozen of them now, they are nice items once clean & working, but buying old loft finds is a bit high risk & the work to get them clean & useable is perhaps a bit much for what one that you spend ages on only for it to not be very good after all & still not worth much to cover the work & buying one. Even a nicer grade one will need a proper clean else your room will smell of old typewriter, pretty much like a man of similar age unaccustomed to washing. Old nicotine smoke, the odd stuff in the u-shaped section the keys rest on & stale ribbon ink does mount up a bit. But properly cleaned & aired again the smell is not a problem. If you smoke you'd likely not notice, but Room Fresheners are the thing today as most don't like smells. Even very high grade ones will have 80-100 years of dirt on & will need lubricating. We've done several of these now & Underwood ones are nicely made & come apart nicely. The things that age the most & will often need replacing are the rubber feet & the cord that fits the carriage to the spring unit. The feet offer many variants in new replacement ones though you'll have to reuse bolts, or machine down the square boss original ones unless you can find the imperial type bolt thread. The cord can still be in good condition & if it is & looks OK leave it be. If any of the end fittings are broken or the cord is snapped, then work needs doing. Even with a good cord but snapped end bits to put wire in & solder may seem a good fix, but it doesn't sit well & lie flat as the carriage goes back & forth & will snag on your addition. The cord would be OK if it was longer & fitted one turn around, but they are usually short. The way we've fixed these is to use stranded hook-up wire as used in electronics & solder loops & fit on, works great. Make the wire a good length to keep some of the wire always wrapped around the spring. How long this will last is unknown, but as stranded wire it'll not just snap. You'll be finding these great old machines often in the raw, direct from a dry loft if you're lucky or a damp shed if you're not. Take as much apart as possible, wash using a strong cleaner that degreases & cleans without needing too much rubbing & a rise down in the bath, hairdryer to fully dry. This must all be done straight away, no letting it sit as rust can form in several places, try to keep the Keys from soaking in water much. Spray, brush, rinse, dry all within a short time for safe results. Then WD40 all over & then let it soak & then wipe the excess away. Make sure the typewriter is dry before WD40 & then make sure WD40 is copiously coated on every part especially the key mechanism, be prepared to make a mess of excess WD40, the spray bottle is the easier option than the can & all the overspray issues. To do WD40 to an excess else if bits rust you'll probably ruin the typewriter! The dirt is mostly general dust, ribbon ink dust & nicotine as smoking was so popular then. All undoable bits should be removed within reason, ie the top carriage, chrome parts etc, if there is no need to totally take it to bits, though you are welcome to try & risk shearing the fixing bolts. They clean up very well usually & if the paint is only slightly worn, leave it as the typewriter is 80-110 years old after all. Chrome can be polished with metal polish & if it's worn through to the base metal, just clean it up to look smart, it was a working machine after all. Rechroming might be worthwhile if it was rusty, but if chrome has rusted the rest could be rusty too, so buy carefully. Buy a dirty dusty-dry looking lightly dusty-rusty one though, ones with bubbling chrome have been damp for a long time & can be high risk too. The Chromed areas, or possibly Nickel plated even, tend to age the worst as damp bubbles the plating up as the steel rusts in ones kept in damp sheds or lofts for 60 years. You can get items rechromed for Cars so these parts should be rechromable too for not too much money. Finding one that is with bright original chrome, not worn off or rusted is hard. Whatever the metal is, once it's gone grey, metal polish can't bring it up bright again. Some typewriters were used & refound by later generations over their 80-100+ year life, or you may find a barely used one all bright chrome & white glass key cards. But odds are you'll find a tired looking one. Some do up better than others, some can be a pain to do, you getting dirty working on one is the only way it'll be. They smell before & after cleaning, so put somewhere to air. They do look nice all smartened up & the more used ones a Shabby Chic sort of lived-a-life look, but tatty & broken isn't much good except for keeping as a spares one until the bits get used elsewhere. are in their hundreds, from cranky looking 19th century ones to 1960s ones. We think the Underwood 3,4 & 5 look the coolest & even the later 1930s grey ones like Churchill used are nice, though we have seen these with the keys not in the QWERTY format which will confuse. 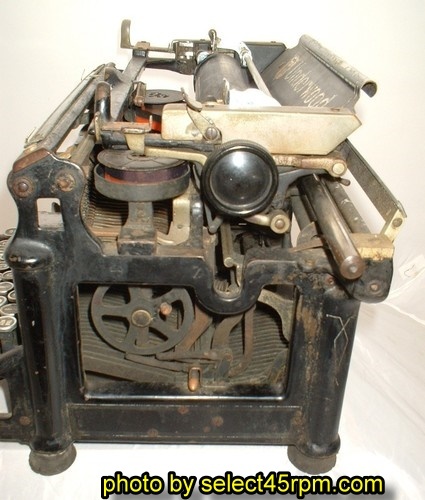 Also if you've used one of these typewriters, you will be aware there is no "0" or "1" so you must type the letters "O" and "I", the letter "I" with the top & base serif "I" will be familiar to older readers. Only trouble is, we used to type silly thoughts onto our first Underwood we had in the 1990s & now find ourselves still typing O and I instead of the numbers. The non QWERTY format typewriter we saw would have messed with your typing mindset, we one-finger type still & barely look at the keys as we know where they are without thinking! One finger typing & 2 hands typing is a personal thing, some people can learn it, but those with a busier mind oddly can't. It's like people who say the letter "H" as "Aitch" or annoyingly as "Haitch" as you hear so much from younger folks & to annoy it's now actually accepted as a regional variation. Harse Oles. Even unthinking Yoof of today do the Jamaican "Acks" as the word "Ask" unaware (duh) that some African types cannot pronounce the "sk" sound as we can't do that Afro Click sound. One early Ska song apparently starts with the lyric "Axe the Birds, Axe the Bees" until you realise it's his linguistic misformation and he means to Ask the said beasts instead. You'd think they'd rewrite the lyric to suit. There are other big brands like Smith-Corona & Remington whose typewriters from pre war years are cool, if not as cool as the Underwoods. Few can be sentimental about the 1950s onwards ones & ebay is mostly these, who wants an obsolete typewriter unless it's decorative & has moved beyond it's original use? The two we mention below didn't look as cool as the Underwood ones, some designs have a cool look today, others don't quite do it. 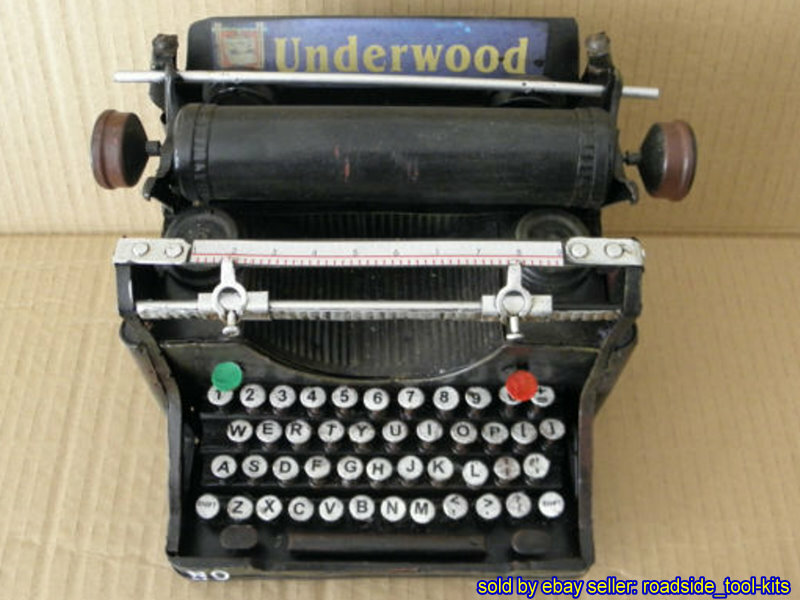 The 2 below were solid items but with tin sides & not made as logically as the Underwood. 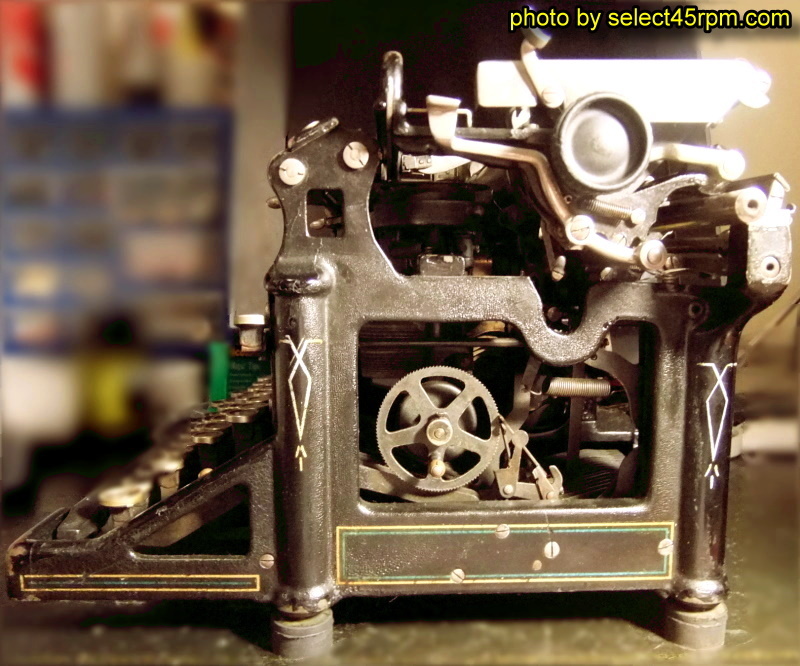 We had a 1926 Remington 12 typewriter in very high grade, all black & glossy. It types nicely, a little quieter than the Underwood. But then you try to take it apart to see what it does & to clean it. We tried but for the risk of too much complicatedness, we left it intact to clean it. Screws undo but the top is held on by other parts & the risk of breaking or putting parts off spec by bending unknowingly is too risky. But it still looked really nice & made a healthy price, which was nice too. We tried another mid 1920s Smith-Corona one, but the seller lied about how bad it was, totally seized up, rusted too far gone, bits missing. Nothing moved so only hammer hits centralised the carriage. Got refunded & gave it away, it still has ornament value. 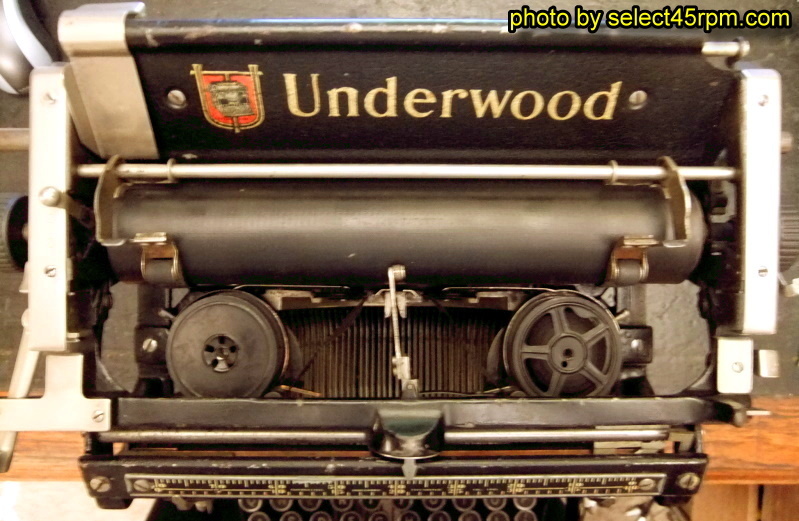 Underwood used a typical standard size ribbon, so if you have the old metal reels you can easily replace the old ribbon with the modern black-red ribbons. To find the metal reels if yours are missing is pretty impossible, you may find one with a seller finding old stock, but you need one to reel it onto. But even the modern reels should fit & you can at least use it. It's odd what items us Humans take out of their original uses & make things anew with them. Industrial art was of high quality in basic mechanical cast iron items from Coffee Grinders to Money Boxes, all now being reproduced in their thousands from getting quality moulds made from original ones. Only the lack of wear & age tells old from new. Not heard of anyone doing a repro typewriter, there are plenty around still to rescue, but when they get rarer these are too complicated precision items to copy. Or are they? Actually there ARE handmade small size copies of these on ebay, 8" x 7" x 5". Strictly non working ornamental & a little crude to say the least & no keys, but certainly amusing, see it below. Is It Worth Us Buying More? At one time we had 8 typewriters here. But they are very hard work to get working sometimes. The balance between buying them & time spent we are a little weary of now, one batch early in the year was very hard work, the 8 batch was equally hard for the ones we sold & one is only a parts one now as not great working & bits nicked for others. Together with the amount of amateur sellers unable to realise how couriers can easily deal with 25kg parcels for as low as £10 makes buying hard too. Often these are estate finds & the seller is just offloading things unaware of how to sell more pro. If the typewriter is clearly a good one we've gone further & contacted to arrange couriers to collect, but we've not seen any nicer ones in a while now. Currently having some better ones here that need work but they've sat here a while now as the appeal of the last two batches being a pain lets them gather dust! But people do like them though, so we may regain interest with further buys. Several months later, 4 good ones still here & the parts one. The others were quite a chore to get good & that's not so much fun, and you can't get good prices for not so great ones with problems, so the 4 have just sat & not really bothered deciding what to do. Here sits the rare 1907 early one, the French one, the sound box one & the high grade chrome one. The high grade chrome might end up on the boxed one to make it even better, but Another Day. We still look to buy typewriters, they do turn up, but often collect only & not good grade to be worth contacting the seller about couriers. Having the gold lettering on the front by the space bar shows the nicer from the more used & redone ones. Prices vary a lot & buying from a photo is a gamble though we've won by gambling as have done only averagely & only one loss one that got used for parts. It could be tidied & sold cheap still, but we feel buying typewriters to do up & resell is often more aggro than the profit made as the condition isn't always as nice as the 4 we have now, reasons why they've sat undecided. They are attractive though & worth buying a nice one is rewarding. We appear to have several pairs of old metal ribbon reels from buying, unfindable items, these will go on the best ones we have left as we'll probably not buy more unless very early like those 1907 ones. for further reading, though you won't read much like we've put here from one who's restored & likes them. The first one we kept as it looks nice. The second one is the 1907 pictured below once restored, if paint left original. The third one is an early one if the black keys are later replacements. The fourth one is the rare 1907 early one before we tidied it up but it still looked a bit rough & the last is a toy typewriter we found amusing.